This recipe is the sunny day version of my nacho soup. It has the same ingredients and flavours in cool, refreshing salad form. I love it packed to the beach. This makes a big batch, enough to serve 4 as a main with some leftovers. Even if you are cooking for less than this I would recommend making the whole batch. Leftovers can be used as a salsa, made into quesadillas, served inside of a halved avocado and scooped out with tortilla chips….there are so many possibilities and shoot, now I’m hungry again 😉 Leftovers can also be mixed with a few cups of your stock of choice to make nacho soup. Double duty meals! I’m looking out for you 😉 Give this a try as a great vegetarian dish for your next BBQ. As always, I love hearing how the recipes work out for you and reading your comments! There are 2 ways to make this salad. The first requires a BBQ, the second does not. Both are equally yummy! Use what you have. If you are using a BBQ, leave corn in husks. Soak in water for at least 1/2 hour. Grill until grill marks appear on the husks. Set aside to cool. Grill peppers and onions until lightly charred in places, but still firm. Set aside to cool. 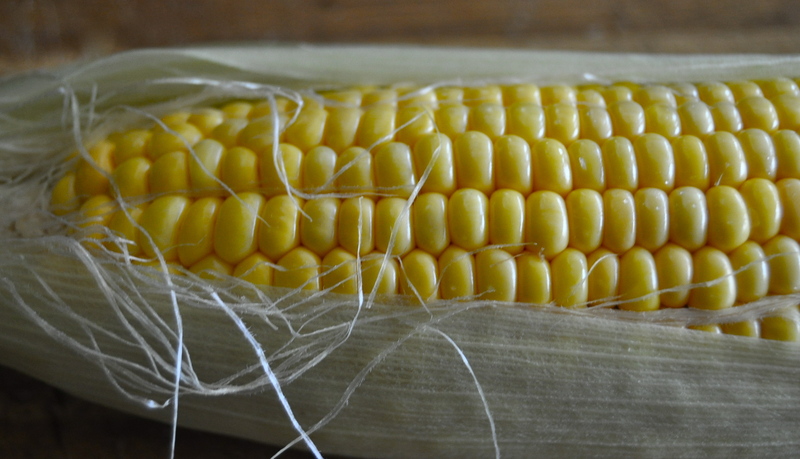 Once cooled, slice the kernels from the corn cob into a bowl. Chop the peppers and onions and add them. If you are using a pan (I recommend cast iron which are nearly indestructible and provide nice charring on the vegetables), heat over medium high heat. Remove the kernels from the corn cob and chop the peppers and onions. Add to the pan and stir-fry for a few moments, until vegetables have softened slightly and are beginning to brown in some places. Set aside to cool. Mix well. Place in the fridge to cool. Flavor improves with time so if possible make a few hours before needed. Feel free to add some sliced avocado, feta cheese, or quinoa into the mix. Make it your own! 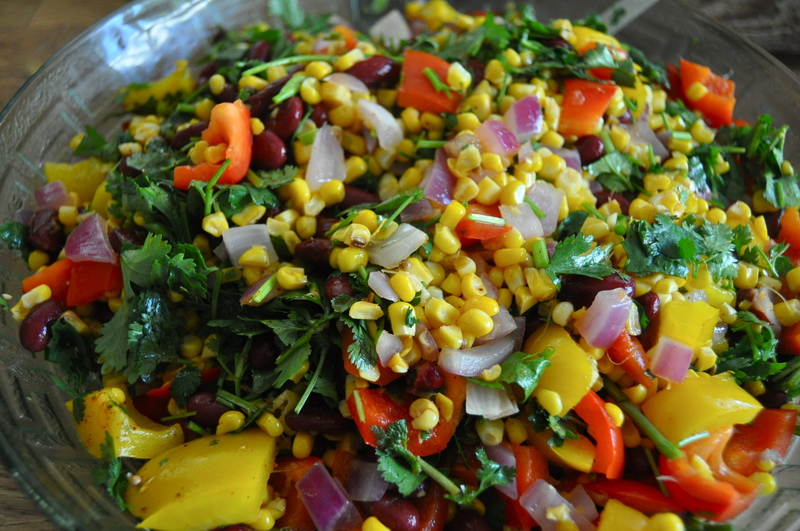 This entry was posted in main, salad, vegan, vegetarian and tagged beach, dairy free, food, fresh, gluten free, grain free, grilled corn salad, healthy, hike, latin american, light, mexican, picnic, recipe, summer, vegan. Bookmark the permalink. Great Salad Megan! I made if for a BBQ at a friend’s house and everyone loved it! It made a lot so we also had some in quesedillas with Mexican cheese – also very yummy!